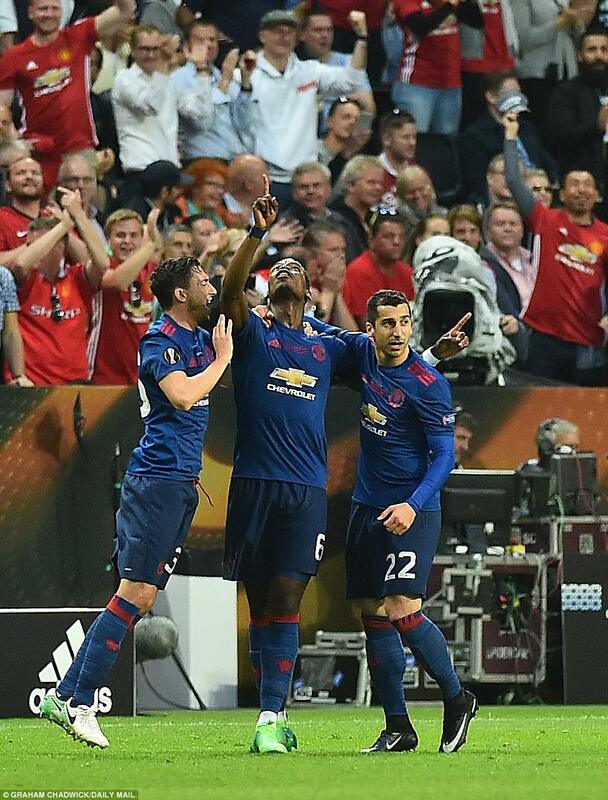 Utd get back into Champs league with Europa triumph! He got it all right, on the night. The mood, the strategy, the selections, the plan. 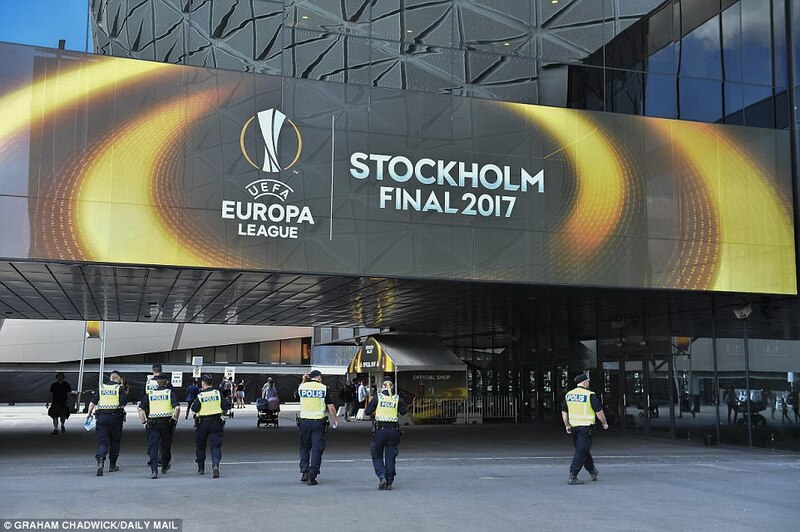 Jose Mourinho said the Europa League represented Manchester United’s safest route to Europe’s biggest tournament next season, and he was vindicated here in Stockholm. This was as straightforward as any European fixture has been for United all season; Mourinho’s team comfortable and superior to a callow Ajax, two goals clear after 48 minutes and in control throughout. 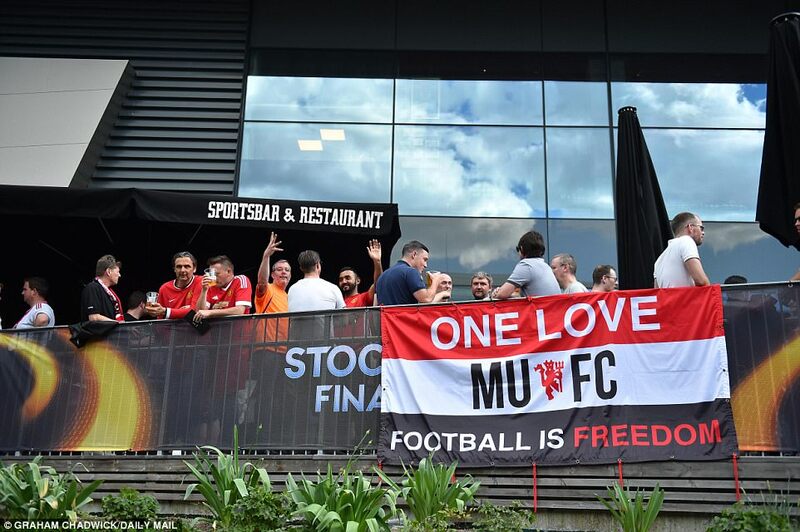 The fear, that the emotion of a traumatic week for Manchester might overwhelm United’s players, did not materialise. They did the job of professionals, exercising their physical superiority over an Ajax team that looked younger than their years, if that was indeed possible. The upshot is that the Premier League – over-rated, inferior in comparison to the great leagues of Europe, according to some – will have five teams in the Champions League next season, qualifiers permitting. This is a good thing. This experience can only hope United grow under Mourinho, too. The Europa League – and its various predecessors – is the only major competition Manchester United haven’t won. Mourinho will take great pleasure in completing that circle. So he should. His judgements calls were also vindicated by last night’s events. Paul Pogba, his big ticket summer signing, scored the first, and has gradually come on to a strong finish to the season. 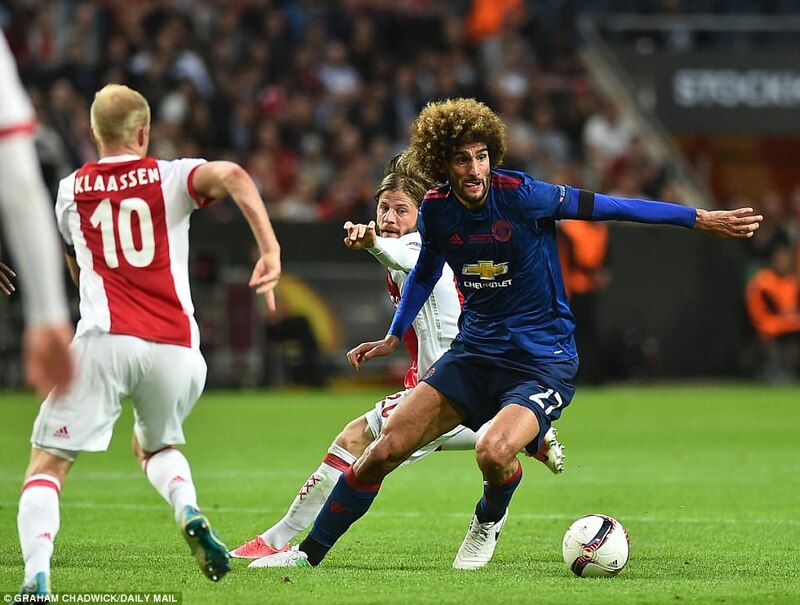 Marouane Fellaini, another controversial selection at times, was excellent, playing in a very advanced role that caused Ajax no end of problems. 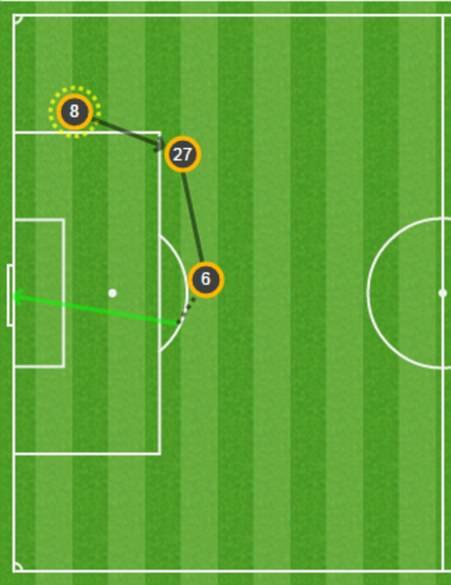 How Paul Pogba opened the scoring for Manchester United with a long-range, deflected strike. Chris Smalling, in for the suspended Eric Bailly, was excellent – and Henrikh Mkhitaryan scored a vital second goal, when just about every analyst would have withdrawn him at half time. In goal, Sergio Romero did not put a foot wrong. Not that he was greatly tested. Mourinho even did the noble thing and introduced Wayne Rooney with two minutes remaining, in what may be his farewell Manchester United appearance. He took the armband, lifted the trophy. If it is the end, it was a fitting one. 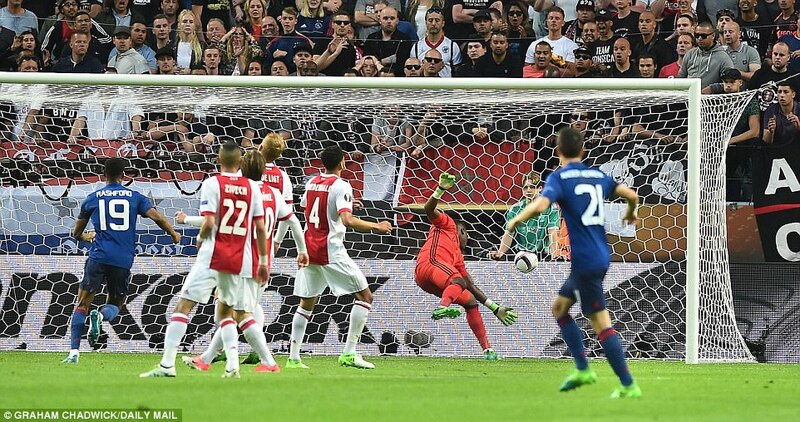 It says something of the nature of the first-half that Ajax striker Kasper Dolberg’s first touch of the game was the kick-off from the restart, after Manchester United scored in the 18th minute. It was not so much that Ajax lacked quality, they were good on the ball as expected and had 65 per cent of possession, more that the youth of this group told. 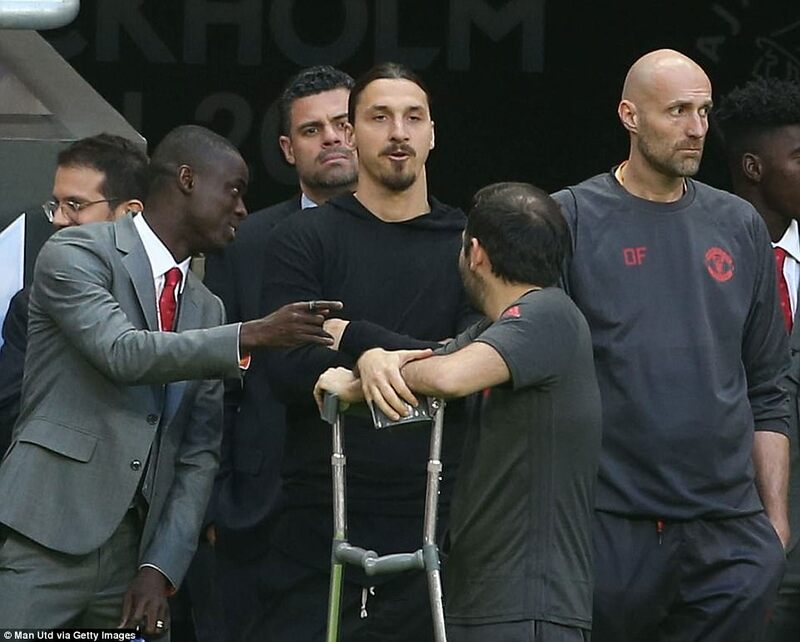 They looked smaller than Manchester United, not just physically but in presence, too. They got muscled off the ball, they lost out in the air, they were eased into touch or simply shrugged off. It was boys against men. Not in football terms, but in terms of strength and application. United looked like they knew how to win a football match, Ajax as if they were still waiting for that lesson. Maybe next term. It helped that Manchester United were, quite literally, bigger. Ajax do not possess physical specimens like Paul Pogba or Marouane Fellaini and the one they do have with anything approaching that level of power was their most impressive player. Bertrand Traore, on loan from Chelsea and surely not for much longer, was the one player who seemed capable of putting it up to Manchester United and it was no coincidence that his 15th minute shot, comfortably gathered by goalkeeper Sergio Romero, represented Ajax’s only chance of the first-half. 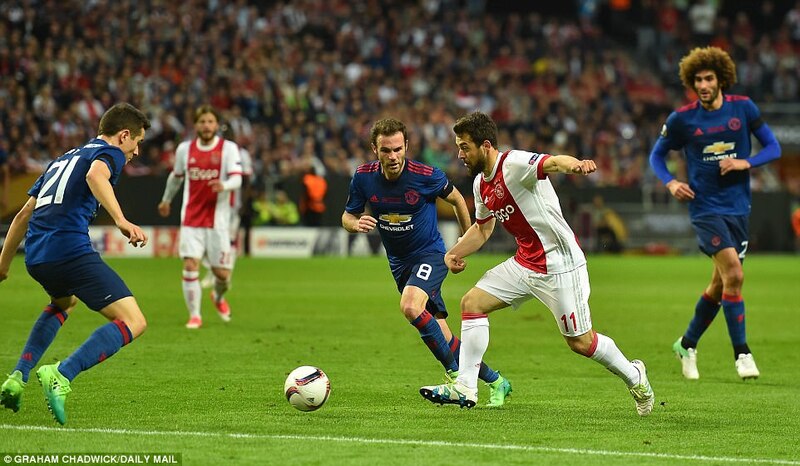 Ajax saw plenty of the ball, but offered little threat. 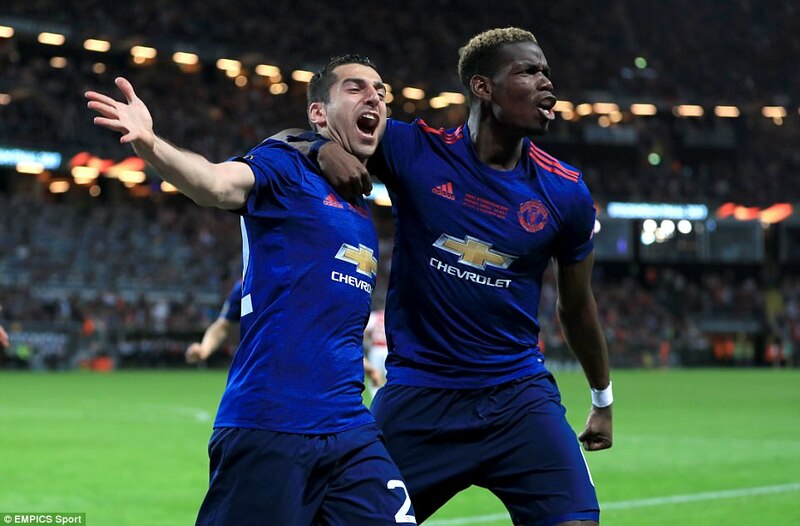 Like Celta Vigo in the first-leg of Manchester United’s semi-final they looked rather lightweight, as if overawed by the occasion; or maybe just the name. 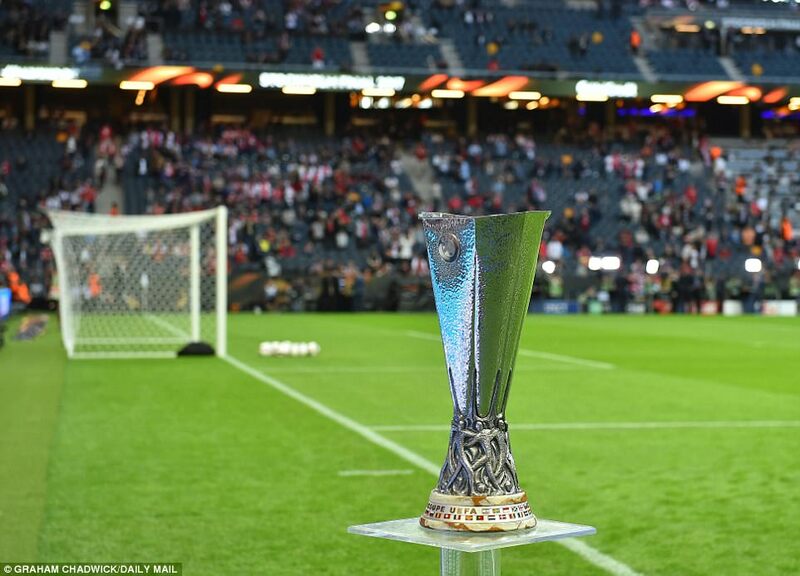 Manchester United still carries cache in Europe – and that the Europa League is the only major trophy the club has not won, gives some idea why. Their star may be on the wane at home but for a young Ajax team – the youngest in a European final – facing Manchester United, with their household names and world record signings, can be a daunting prospect. It certainly looked that way. To have run Feyenoord so close for the Dutch title this season, Ajax must have something; certainly more than they showed in the opening 45 minutes here. The game was only 30 seconds old when Ajax showed the first sign of nerves. Goalkeeper Andre Onana made a hash of a simple ball into the box, colliding with team-mate Joel Veltman whose treatment delayed the game. Paul Pogba tried his luck from the edge of the area, amid the confusion, but missed. Onana never looked wholly comfortable after that, though, and Jose Mourinho will have been disappointed that his players did not do more to test the 21-year-old after his wobble. Juan Mata got a decent ball into the box after nine minutes although Fellaini couldn’t get his head to it. That aside, however, chances were few. 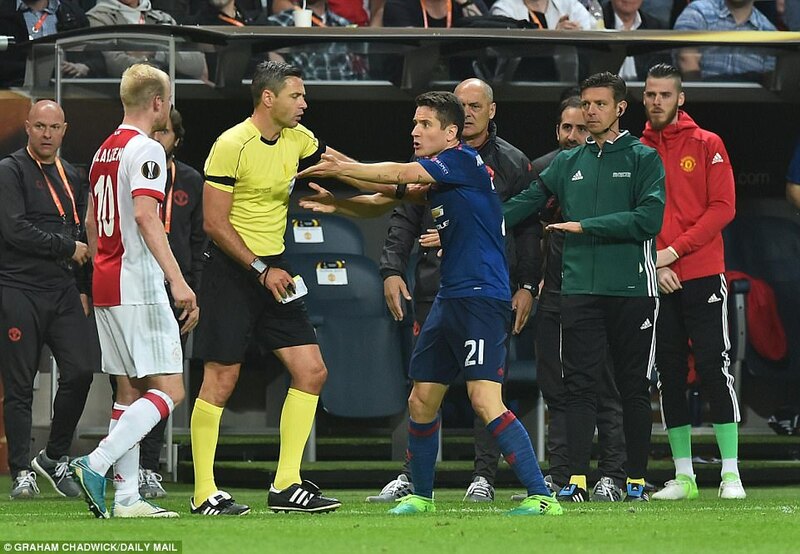 Indeed, Ajax were beginning to come into it a little when Manchester United scored. It was a goal that came with a giant dollop of good fortune. United had possession around the Ajax box but to little effect, Fellaini finally pushing the ball to Paul Pogba, for a shot. He tried one, not his best, but it struck the inside of Davinson Sanchez’s leg and completely wrong-footed Onana. The goalkeeper always looks bad in those situations and some will feel Onana should have reacted quicker, but the trajectory went against all his expectations. He was left grasping at air, United to celebrate a good slice of luck. On the bench, Mourinho did not let his emotions show. As his staff leapt from their seats, he stayed down, eventually raising his eyes to the heavens, whether in relief or something more spiritual, who knows? It has been a difficult week for his club, and his adopted city. The fans sensed it, too. 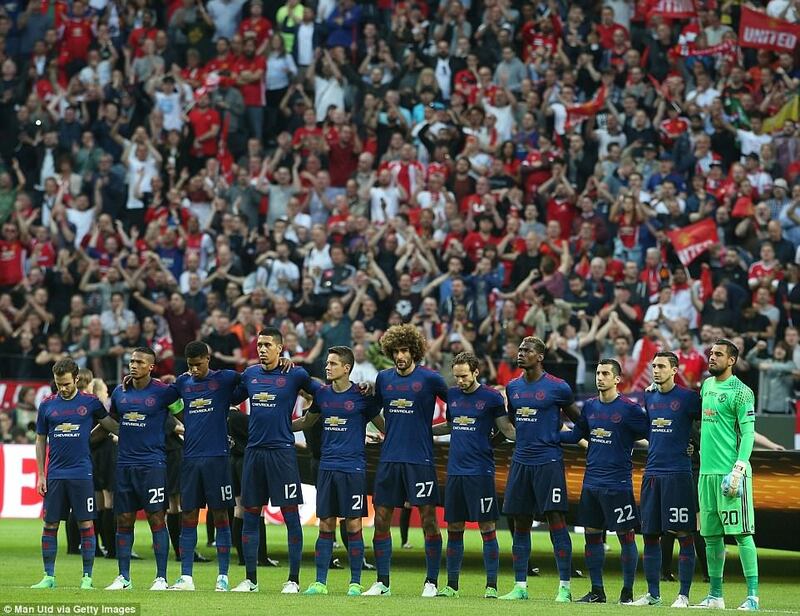 They sung about Manchester as much as they ever did United, acknowledging that this was bigger than just one club. What was plain, however, was that United had the beating of Ajax for pace, too. Marcus Rashford was always a problem, as was captain Antonio Valencia, who forced a good save out of Onana on the run after 24 minutes. To be fair, he was due one. 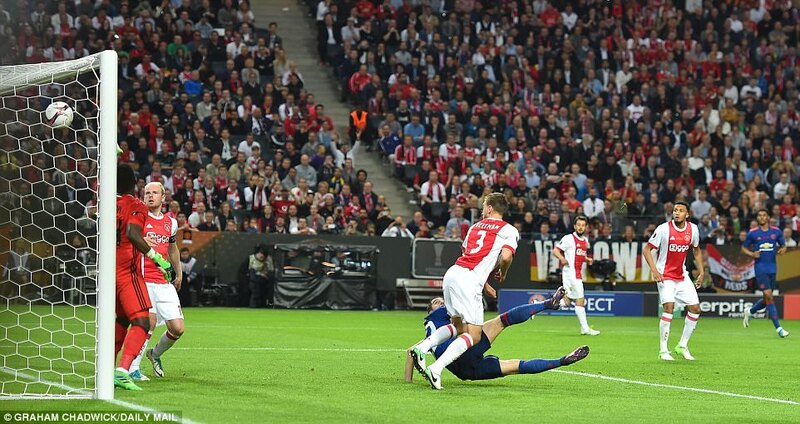 Yet if Ajax had hoped to regroup and come again in the second-half, their best laid plans were scuppered just three minutes after the restart. Daley Blind took the corner, won by Chris Smalling – preferred to Phil Jones, and correctly so, he was magnificent in the air all game – and then flicked on with his back to goal by Henrik Mkhitaryan, who has scored 11 goals for United all season, six in this competition. United eased through the rest. Professionalism, not emotion, won the night.